Nelson Instruments are built from the finest materials and workmanship regardless of price and are guaranteed to the original purchaser against defects contributed directly to faulty workmanship and materials for a period of two (2) years from the date of purchase. Nelson Mfg. will gladly repair any Nelson instrument against such defects. Expressage involved in shipment both ways is to be paid by purchaser. Ordinary wear and tear of metal parts and faults due to excessive temperatures, abuse or neglect, and extreme or inadequate humidity are excepted. Nelson Mfg. will repair or replace any defective instrument at our discretion. Your satisfaction is my priority! That is why I offer you a full, 3-day, money-back guarantee. If you are not fully satisfied with your Nelson instrument for any reason, you may return it within 3 days after receipt for a full refund. (Shipping charges are non-refundable.) Instruments returned must be carefully packed and fully insured against breakage in transit. Instrument must be received in the same condition you received it. Instruments showing wear or abuse will be subject to a 20% restocking fee. Any instrument returned un-insured and broken in transit will not be refunded. The Coquette bass features a neck-through body design with a hard maple neck and soft maple body wings. Hipshot tuners and vintage-style bridge are utilized. 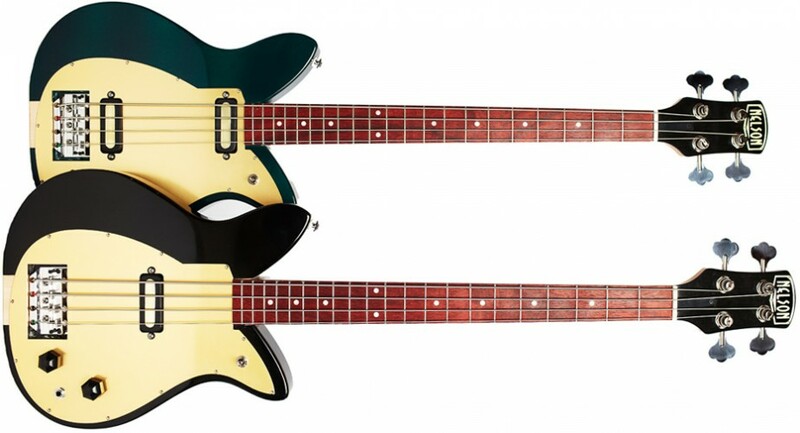 The Coquette bass comes standard with a Nelson “Dynamo” pickup. These pickups have been specially designed to produce a fully balanced sound with rich, tight bass and clear, pronounced treble. The pickups are wax potted so undesirable microphonics are eliminated. The anodized aluminum pickguard affords greater wear resistance and beauty, while blocking unwanted magnetic interference which causes hum. The Coquette bass is finished in genuine satin lacquer. Many color options are available; please email with your request!